Past the steel-and-glass skyscrapers and stacked apartment complexes, a village of houses built in traditional Korean style can be found in northwestern Seoul. But something about them looks very new. 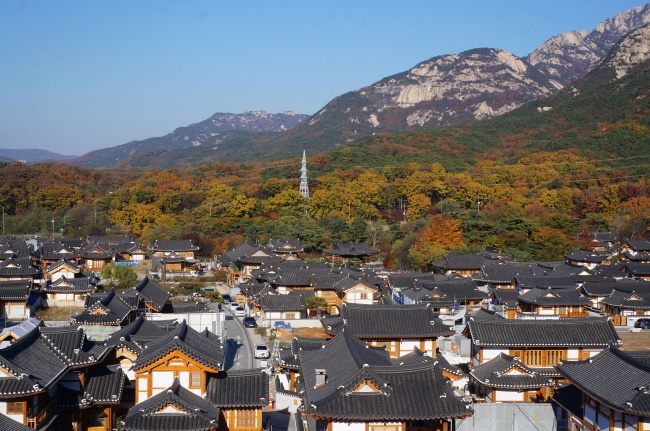 Designated by the Seoul Metropolitan Government and Eunpyeong-gu in 2011 as a housing development site, Eunpyeong Hanok Village aims to encourage those looking to build hanok. Middle-aged couple Park In-ki and Park Eun-jeong live in the village, together with their two sons and the husband’s mother. 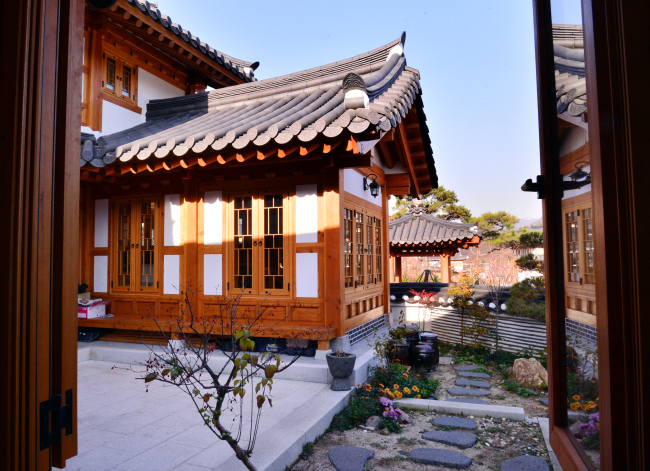 The family built a modern hanok and moved into it in April, naming the house Ham Kyeong Ru. Park In-ki signed the documents for the land situated in the foothills of Bukhansan in 2013. Park now thinks, he might have been “possessed” by something at the time. The move was partly for his aged mother. Living in a typically tightly-clustered apartment, it was as if she were imprisoned. There was nothing for her to do, other than watching TV or staring blankly at the ceiling. The sight pained him. It was only in 2017 that the construction actually began. 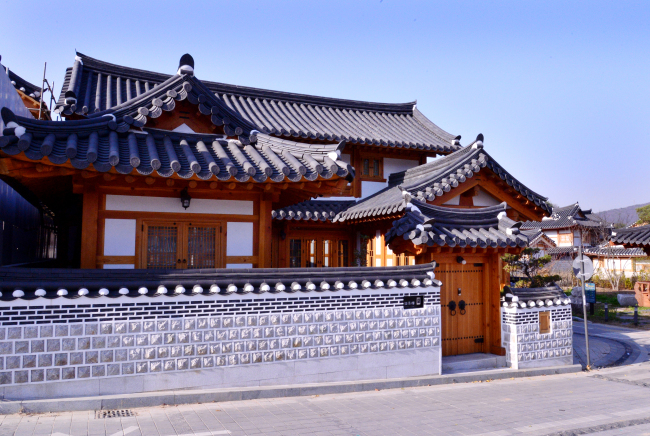 Until then, the family traveled throughout the country, visiting a variety of hanok houses. After the visits and some extensive learning through books, they became sure of what they wanted. “Thanks to the studies, we were able to begin with a certain amount of confidence. That is also why we are mostly satisfied with the outcome,” the wife said, sitting at the dining room filled with mid-afternoon sunlight. Ham Kyeong Ru is a two-story hanok with a basement. The house has daecheong, the equivalent of a living room, in the center. The first floor is made up of a kitchen and sarangchae, a guest room. On the second floor, there are two bedrooms and also a small common room. The atmosphere is bright yet tranquil. 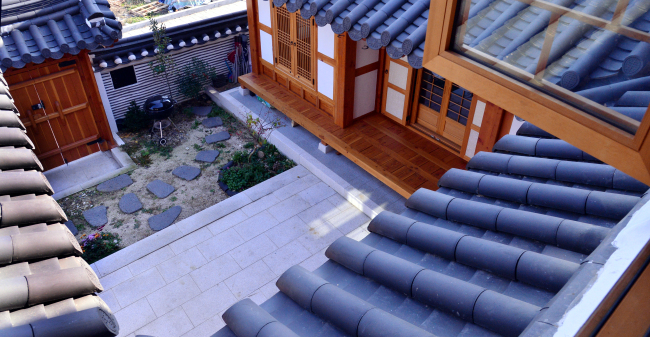 Wind and sunlight freely flow in and out of the space, like classic hanok. The wooden house is light in color, but the color is somehow rich, as the wood shows its years. 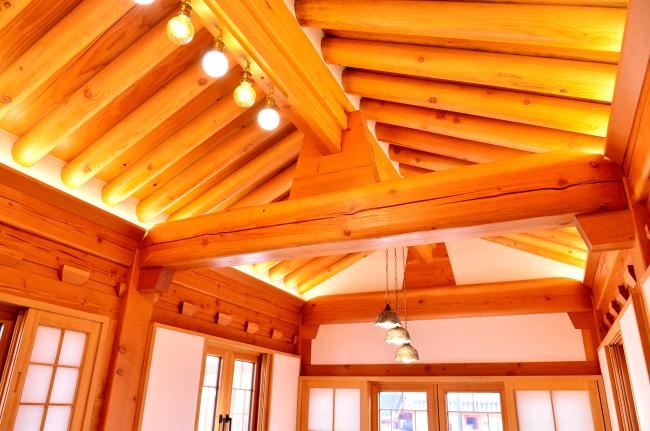 “For hanok, you do not really need any decoration because the interior is also the exterior. In a way, it is an incomplete structure, but therein lies its charm,” the husband Park said. The house offers modern conveniences. 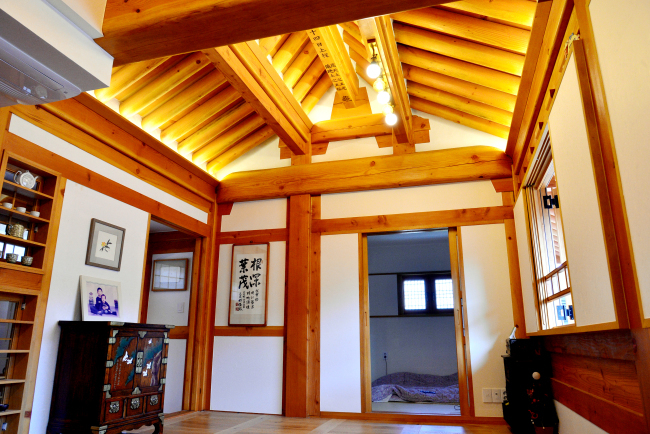 A traditional hanok structure should not have any space for an entrance way. In period dramas, we see how the shoes are laid outside. In real life, this would be greatly inconvenient, so Ham Kyeong Ru has a separate space for shoes. Though the windows are traditionally shaped, with symmetrical wooden lattices, they are the products of modern technology offering full insulation. Through the windows, the eaves of nearby hanok residences echo the mountain ridges, creating an ink-and-wash painting atmosphere. Unlike Bukchon Hanok Village or Seochon Hanok Village in downtown Seoul, the regulations on hanok are more relaxed here, allowing the residents to explore new options. That is why there are two-story hanok houses. But that does not mean Eunpyeong-gu is an entirely free field. The restrictions are still tight. Even Ham Kyeong Ru could not receive the whole subsidy amount, as it did not fully meet the regulations. Nevertheless, the house was recognized as one of the best built hanok by the Ministry of Land, Infrastructure and Transport this year. 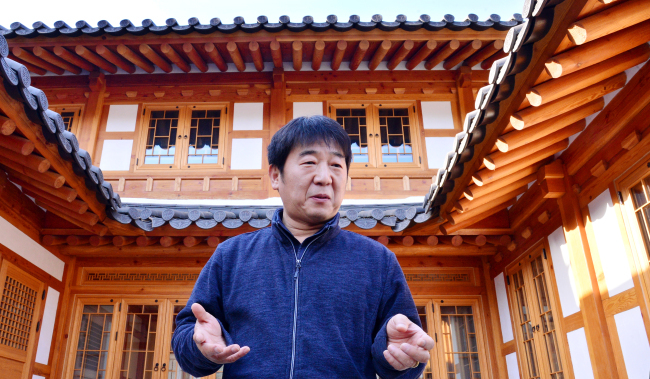 Hanok villages in the city center have been experiencing difficulties with overtourism, and Ham Kyeong Ru could one day be subjected to “too many tourists.” But the family is not too worried, as they want more people to feel the joy of living in a modern hanok. The village is populated by the likes of the Parks. According to the couple, the villagers have formed a sort of a community -- or in simpler terms, they have become friends. Though the 18-year-old elder son had to make some sacrifices after the family moved into the new house -- attending a school 1 1/2 hours away -- even he is satisfied with the new house. “One day, I asked my son, if he likes it here. He simply said, ‘It is like living in a picture frame. Living in an apartment, the outside looked like a frame. We only looked outside but never went out. But here it is different.’ The words struck me,” she said.